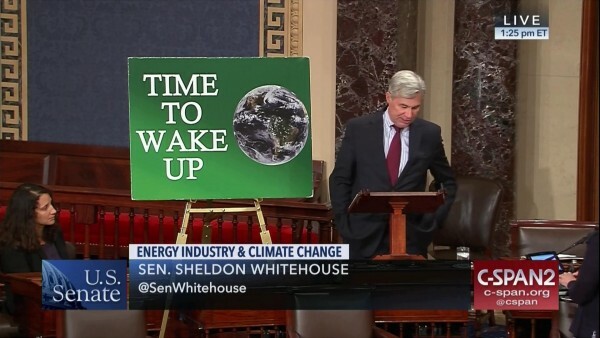 Every week of every Senate session for the last six years, Sen. Sheldon Whitehouse has taken to the floor to urge his colleagues to “wake up” to the dire consequences of their inaction on climate change. But the slumbering chamber keeps hitting the snooze button. That cycle — a weekly call to action followed by inaction — will almost certainly be repeated on Tuesday when the Rhode Island Democrat rises to deliver the 200th “Time to Wake Up!” floor speech, a kind of feedback loop that even climate change skeptics can appreciate for its durability. Still, it won’t be a celebratory occasion with polar bear costumes or biodegradable confetti when Whitehouse takes the floor on Tuesday. Instead, the speech will reflect how, despite incremental progress, climate change policy remains polarizing to the point of paralysis. Ahead of that milestone speech, Whitehouse reflected on its origins and what would precipitate the end of the long-running series. The conversation also touched on climate policy in the age of President Donald Trump — and Whitehouse’s belief that consequential action could come sooner than pundits think. With cap-and-trade legislation stalling in the Senate in that same year — after the Obama White House decided not to spend more of its political capital on the proposal following its health care slugfest — Capitol Hill was a lonely place for a climate advocate. “The silence in Washington, both from Republican colleagues who used to be engaged and from the White House, was deafening and extremely frustrating, and environmental communities and scientific folks around the country were horrified that we too had gone basically dark on climate change,” Whitehouse said. Representing the Ocean State, where he was once state attorney general, Whitehouse lives in Newport, Rhode Island, an ocean town famous for beachside mansions built with Gilded Age money. Its proximity to the Atlantic means it is ground zero for climate change, and Whitehouse says he sees weekly full-page ads in his local paper for services to protect homes from the rising sea. Whitehouse’s polar opposite on the issue, Sen. James M. Inhofe, who wrote a book calling climate change a hoax and once brought a snowball to the Senate floor to prove it, may admire Whitehouse’s tenacity but says he’s wasting his breath. When he started in April 2012, Whitehouse used the speeches to explain the science and basic facts behind climate change. They evolved to focus on climate change’s effect on coastal communities, many of which he visited to do his research. The speeches also began incorporating investigations into the so-called dark money lobbying efforts to block policies to slow global temperature increases. Whitehouse, whose father worked for the CIA and State Department, experienced from an early age the importance of American leadership in the developing world on consequential global affairs. That lesson, he said, inflames his anger about the influence of his opposition as the United States steps away from global leadership on climate change, with Trump announcing in June 2017 that the country will leave the Paris climate agreement. The industrialist Koch brothers, ExxonMobil, coal magnate Bob Murray and the American Petroleum Institute, among others, have all earned scorn in Whitehouse speeches. And more recently, a trio he calls the “three fossil-fuel stooges,” EPA Administrator Scott Pruitt, Interior Secretary Ryan Zinke and Energy Secretary Rick Perry, have joined his burn list for their deregulatory actions. Some of Whitehouse’s villains have publicly softened their climate stances, with ExxonMobil, for example, backing the Paris agreement and tepidly endorsing a carbon tax. More Republicans, such as Sen. Lindsey Graham of South Carolina and Lisa Murkowski of Alaska, have even begun to dip their toes into some climate interest. A bipartisan Climate Solutions Caucus has formed in the House. At first, as Whitehouse tells it, colleagues responded to the weekly speech — which he always delivers while standing next to a frayed, bright green poster declaring that it’s “Time to Wake Up” — with curiosity. Then, the interest turned into annoyance. Now, he said, the speeches — which, as Inhofe noted, are played to an empty chamber — are generally accepted and grudgingly admired. The speech demands work, and Whitehouse readily admits he never thought they would go on this long. There have been times when he thought the cycle would end, but now the only endpoint he can see is if Congress actually does something meaningful on climate change. That may not be so far away, he predicted. The most likely policy is the carbon tax — something he said could happen within the next two years — especially if Democrats take control of one or both chambers in 2018. House Republicans remain publicly skeptical on the issue, voting as recently as 2016 to pass a sense of the House resolution in opposition to a carbon tax. “This, for me, has to continue until there is serious bipartisan activity underway in the Senate, but that could be as early as later this year or early next year,” Whitehouse said.